Some nights it seems like sleep just isn’t in the cards. Maybe you’re nervous about a big presentation the following day, or you drank too much caffeine too close to bedtime. One night of poor sleep may not have lasting effects, but you may be surprised to learn that even one night of inadequate sleep can lead to sleep deprivation. 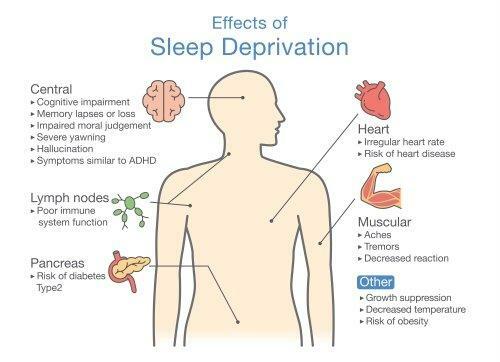 Chronic sleep deprivation can affect everything from your ability to concentrate on work or at school to your body weight, mood, and quality of life. There is no doubt that restorative sleep is essential no matter your age, but as you get older, it seems like there are more obstacles standing in between you and a restful night. In this article, we’ll discuss the topic of sleep deprivation in greater depth. You’ll learn what it is, what causes it, and what symptoms can come from it. We’ll also discuss diagnosis and the various treatment options you might consider. According to the Centers for Disease Control and Prevention (CDC), about 35% of American adults surveyed reported fewer than 7 hours of sleep per night. Though seven is not the magic number for everyone, these statistics do point to a common problem. In fact, the CDC declared insufficient sleep a public epidemic in 2014. Sleep deprivation occurs when you get less sleep than you need to feel awake and alert during the day. Everyone is different when it comes to how much sleep that really is. When you have a night of poor sleep, or you don’t get enough sleep, you may find that you feel tired during the day and you may have trouble concentrating. If you continue to get too little sleep at night, you will start to create a sleep debt – it’s almost like overdrawing your bank account. The longer you go, the more overdrawn your energy account becomes and the more severe your symptoms. What Are the Symptoms of Sleep Deprivation? Your body needs sleep to heal itself and restore chemical balance. During sleep, your brain builds new connections, strengthening memories and making newly learned information permanent. Without adequate sleep, all the systems in your body can be affected. In fact, sleeping for fewer than 6 to 8 hours per night can increase your risk of early death by as much as 12%. In cases of prolonged sleep deprivation, you may even experience psychiatric consequences such as disorientation, paranoia, and hallucinations. Sleep deprivation can also lead to impairments in executive function which can lead to problems like poor planning, increased risk-taking behavior, disorganization, decreased judgment, and poor prioritization. Not only can sleep deprivation make it difficult for you to complete daily tasks, but it can make them downright dangerous. Many research studies have shown that prolonged sleep deprivation can greatly increase your risk for accident and injury – it also magnifies the effects of alcohol on the body. To give you a statistic, consider the fact that driver fatigue was the primary cause for over 80,000 motor vehicle accidents between 2005 and 2009. It caused over 800 deaths in 2016 alone. These statistics highlight the fact that sleep deprivation affects more than just the sufferer – it can put others in danger as well. Immune System – Lack of sleep prevents the immune system from producing the cytokines needed to fight infection – this means it could take longer for your body to heal and may increase your risk of developing chronic illness. Respiratory System – Sleep deprivation has been linked to an increased risk of both new and worsening respiratory diseases. Hormones – Lack of sleep affects leptin and ghrelin, the hormones that control feelings of hunger and satiety. It also affects the release of insulin which affects fat storage, increasing your risk for type 2 diabetes and weight gain. Cardiovascular System – The blood vessels heal and rebuild during sleep, helping to maintain blood pressure and inflammation. Sleep deprivation increases your risk for heart disease. Prolonged sleep deprivation can wreak havoc on your body, affecting your day-to-day function as well as your overall health. Lack of sleep can even impact growth hormone production which is particularly dangerous for children as well as testosterone production in men. It is also particularly damaging for pregnant women – a woman needs several hours more sleep per night during the first three months of pregnancy. As you already know, sleep deprivation occurs when you do not get a healthy amount of sleep. Personal Obligations – It is very common for people to become sleep deprived when family or personal obligations eclipse the importance of sleep. For example, if you are a caregiver to a loved one suffering from a chronic illness, providing care may restrict your sleep time. Voluntary Behavior – Some examples of voluntary behavior which restrict sleep include staying up too late or getting up earlier than necessary. For some people, these behaviors are voluntary but unintentional – this is actually classified as a sleep disorder called behaviorally induced insufficient sleep syndrome. It is a type of hypersomnia that involves a pattern of restricted sleep that lasts for at least three months and occurs on an almost daily basis. 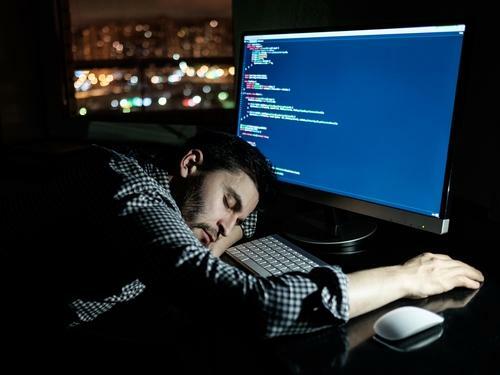 Work Hours – If you work so many hours that you physically do not have time to get enough sleep, sleep deprivation is a foregone This is common in shift workers, people who work overnight, people who work overtime, and people who work multiple jobs. 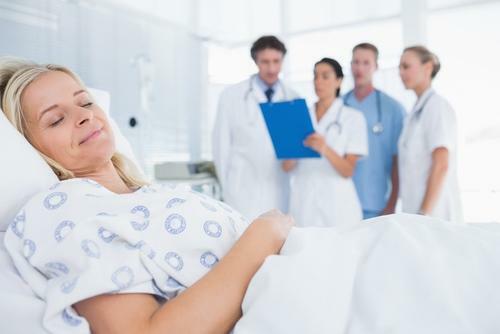 Medical Problems – In many cases, it is a medical problems or underlying sleep disorder that causes sleep disturbance which contributes to sleep deprivation. Some examples include sleep disorders like insomnia or obstructive sleep apnea, psychiatric issues like anxiety or depression, and medical problems like hormone imbalance and chronic illness. Sleep deprivation affects anyone and everyone who doesn’t get enough sleep. There are, however, certain factors which may increase your risk for becoming sleep deprived. Adolescents, for example, are more likely to be sleep deprived due to things like early school hours, voluntary behavior, and mental health issues. People who perform shift work, work long hours or work multiple jobs are more prone to sleep deprivation, as are people suffering from sleep disorders and medical problems that cause insufficient or interrupted sleep. How is Sleep Deprivation Diagnosed? If you are suffering from sleep deprivation, your doctor may be able to help you identify and treat the underlying cause. In cases of occasional sleep deprivation, treatment may not be necessary. For example, if you stay up late to study for a test the following day, you may feel fine after a full night’s sleep the following night. If, however, you struggle to get enough sleep on a regular basis, or if you are feeling the effects discussed above, it may be time to talk to your doctor. Diagnosis of sleep deprivation begins with a medical history, a review of your symptoms, and a physical exam. During this exam, your doctor will work to rule out potential underlying causes for your sleep disturbance. If your doctor suspects a sleep disorder, you may be asked to undergo a polysomnography – a type of sleep study that monitors various metrics including blood oxygen levels, heart rate, respiration rate, body movements, and brain waves. Additional diagnostic tests such as urinalysis, bloodwork, and imaging scans may be required to identify an underlying medical problem. If your doctor suspects that a psychiatric issue might be the root cause of your sleep disturbance, you might be referred to psychologist for diagnosis and treatment. What Are the Treatment Options for Sleep Deprivation? The only true treatment for sleep deprivation is, of course, sleep. Aside from actually getting more sleep, treatment may also involve treating any underlying condition that is preventing you from getting a good night’s sleep. In some cases, it may be helpful to work with a therapist or a sleep specialist to develop coping techniques and to improve sleep hygiene for a better night’s sleep. When it comes to treatment for sleep deprivation, there are three primary avenues of treatment: behavioral, cognitive, and medical. Relaxation techniques are one of the most effective behavioral forms of treatment for sleep deprivation. If you have trouble with anxiety, depression, or a sleep disorder, learning progressive muscle relaxation may help you become relaxed enough for sleep. Breathing exercises, mindfulness training, and guided imagery techniques can also be beneficial. Another behavioral treatment method involves stimulation control. You simply control pre-bedtime activities and surroundings to create and maintain a healthy sleeping pattern. For example, only using the bed for sleep (versus other activities like watching TV) and only going to bed when sleepy can create an association between being in bed and sleep. Cognitive treatment for sleep deprivation most often takes the form of cognitive behavioral therapy (CBT). This is a form of therapy designed to help the patient identify and alter the patterns of thought that are linked to certain behaviors. CBT can help you identify triggers for the things that cause you to sleep poorly and can help you learn coping strategies as well as relaxation techniques to deal with them. It can also help you develop and maintain a healthy sleeping pattern. Finally, medical treatments are available if behavioral and cognitive therapies are insufficient. There are both over-the-counter and prescription medications available for the treatment of sleep deprivation. These medications can help you fall asleep or stay asleep, improving your chances for getting a night of restful sleep. Some options include things like benzodiazepines, non-benzodiazepine hypnotics, and melatonin receptor antagonists. 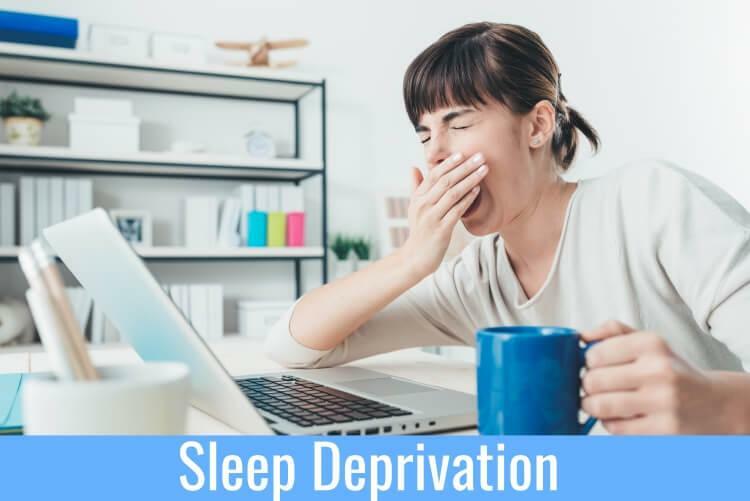 Though maintaining a regular sleep schedule is the only real way to prevent sleep deprivation, there are coping strategies you can employ during periods of insufficient sleep to help minimize the effects. Caffeine – Drinking caffeine should not be a substitute for sleep, but it can help you stay alert if you haven’t gotten enough sleep. Stick to low doses of 75mg to 150mg after a night of poor sleep but be careful of going too much higher. High doses and frequent use of caffeine can lead to tolerance, addiction, and withdrawal. Extra Sleep Ahead – If you know that you’ll be getting less sleep than usual one night, sleeping extra the night before might help. This is known as a “prophylactic nap,” and it might help minimize the negative effects of sleep deprivation. Naps – If you’re having trouble staying awake and alert following a period of sleep deprivation, taking a brief nap of 30 minutes or less could help. Avoid taking longer naps because you may have trouble waking and you may feel even more groggy afterward. Other Stimulants – If caffeine isn’t enough to keep you alert and awake following a period of sleep deprivation and you absolutely need to be awake, stronger stimulants such as amphetamines, methylphenidate, and modafinil may help. Just be aware that these come with a risk of side effects and dependence. There is no substitute for a good night’s sleep. If you have a medical problem or sleep disorder that prevents you from sleeping well, don’t delay in bringing your concerns to your doctor. Though it may take time to heal from the effects of chronic sleep deprivation, the symptoms of poor or inadequate sleep can happen very quickly, so don’t take your health for granted. Get help if you need it! Disclaimer: The information on this website is not intended to be used as a substitute for professional medical advice, clinical diagnosis, or treatment. 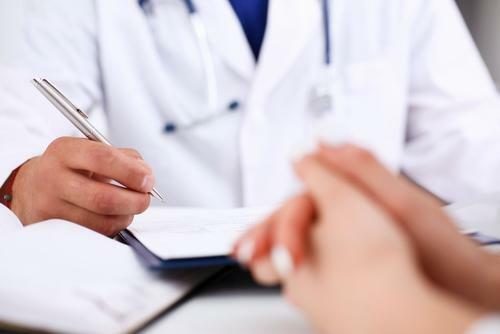 Always seek the advice of your personal physician or another qualified health provider with any questions you may have regarding a medical condition. About Kate Barrington Kate Barrington holds a Bachelor’s degree in English and is the published author of several self-help books and nutrition guides. Kate also holds a certificate in fitness nutrition and enjoys writing about health and wellness topics including sleep hygiene, natural remedies, and sleep disorders. In addition to her work as a ghostwriter and author, Kate is also a blogger for a number of holistic health companies and writes product reviews about mattresses and other sleep solutions.